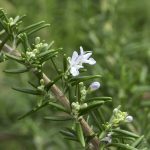 Rosemary is a popular culinary herb in the home garden. It can be planted either in the ground or in containers, but depending on how you grow this herb, how you water your rosemary plant differs. Rosemary is a plant that is easy to grow in the ground, mostly because it rather drought tolerant. 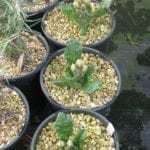 A newly planted rosemary plant needs to be watered frequently for the first week or two to help it become established, but after it has been established, it needs little in the way of watering other than rainfall. Rosemary is drought tolerant and can go quite some time without being watered when planted in the ground. In fact, often what will kill a rosemary plant growing in the ground is too much water, and rosemary is very sensitive to drainage. It doesn’t like to grow in soil that doesn’t drain well and can succumb to root rot if left in soil that stays too wet. Because of this, you should make sure to plant your rosemary in well draining soil and after it is established, then only water in times of severe drought. While rosemary grown in the ground needs little water from the gardener, rosemary grown in containers is another matter. A rosemary plant in a container doesn’t have the chance to grow the extensive root system to seek out water like the plants in the ground. Because of this, they are far less drought tolerant and need to be watered frequently. But, like ground-planted rosemary, those grown in containers are also sensitive to drainage. With container-grown rosemary, water the plant when the soil is just dry to the touch on the top. It’s important that you don’t let the soil dry out completely as rosemary plants lack signals like droopy leaves or wilted stems to let you know they are dangerously low on water. They can actually die before you realize there was ever a problem. Therefore, always keep the soil of your potted rosemary at least a little moist. On the flip side, make sure the pot has excellent drainage. If the soil becomes too wet, the plant can easily develop root rot and die.